in Mobile Marketing with tags #roastjoffrey, adweek, Direct Messaging, GameofThrones, Gap, HBO, instagram, Michael Kors, NonStopDanceSpot, Pinterest, Pop Dongle, Pop Secret, Target Both comments and trackbacks are closed. The holiday season is an exciting time to work in advertising given the plethora of fun, seasonal campaigns – and of course, the holiday parties. To help extend the fun of our own holiday party, we created the Non-Stop Dance Spot and invited people to show us their best six-second move. You can learn more about the project here. We were also incredibly honored this week to be named Adweek’s Digital Agency of the Year for 2013 – a testament to the incredible passion and curiosity of our people and partners. Read on to catch up on some of the week’s biggest headlines in the marketing world. Based on the insight that King Joffrey Baratheon of HBO’s hit show Game of Thrones is the most hated character on the internet this year – 360i research discovered that people associate him with the word “hate” 3.5X more than any other character – we partnered with the brand to launch the first-ever social media roast to give fans a chance to burn Joffrey. For 48 hours, HBO curated fan-submitted roasts (via Twitter, using the hashtag #RoastJoffrey) on RoastJoffrey.com and enlisted cast members, celebrities, content creators and other influencers to bring the insults in their own unique ways. Brands got in on the action too, with Charmin sending in a hilarious tweet and 360i client Oreo using a Vine video to join the fun. Instagram took a jab at Snapchat this week by unveiling a new private messaging feature that allows users to exchange content outside of the public eye. The news came just days after Twitter updated its DM feature to include private photo sharing. Gap was one of the first brands to make use of Instagram Direct, encouraging fans to comment on a post, and rewarding the first 15 commenters via Direct Message with a limited edition Gap product. Though Direct Messaging doesn’t promise much reach on the platform for brands, it’s already proving its ability to strengthen connections between brands and fans through opportunities such as facilitating product distribution and coupons, which up until now had proved challenging. 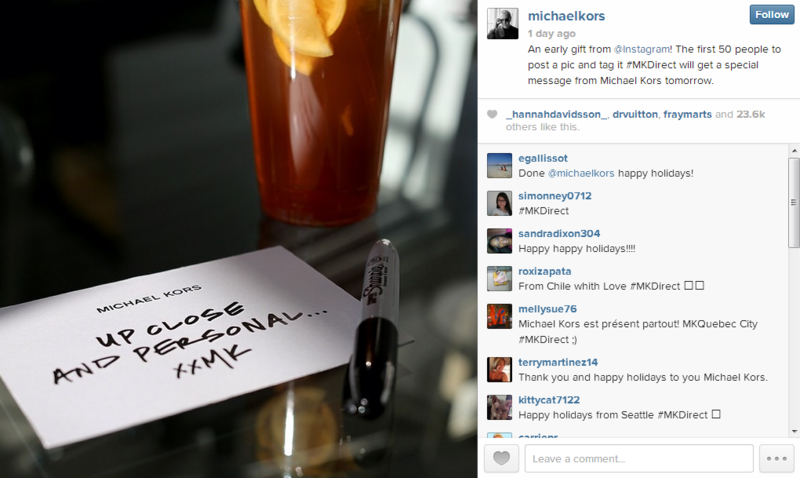 Michael Kors also posted using this new feature, and facilitated fan interaction by saying that the first 50 fans to post using #MKDirect would receive a message the following day. Google+ has announced a new socially-powered banner ad format, +Post ads, which will allow advertisers to amplify their Google+ content across the Google Display Network. The new +Post ads further entrench Google+ in Google’s product architecture – and give marketers the ability to target relevant messaging at scale. Read 360i’s blog post on the topic to learn more. Target’s new online catalog, the Target Awesome Shop, aggregates the store’s most-pinned content on Pinterest and best-reviewed products. The shop currently hosts over 1,000 products and is refreshed daily, creating a curated experience for consumers interested in Target’s most sought-after products. The move by Target represents a new approach to e-commerce, providing shoppers with an experience that allows them to quickly browse and shop for the store’s highest-rated and most desirable products. Pop Secret’s mobile phone attachment, Pop Dongle, now offers you that addicting smell of freshly popped popcorn right at the touch of your fingertips. The brand’s mobile game, Poptopia, asks users to pop kernels, and as the game sends frequency signals, the Dongle emits a popcorn scent. Though the game is a free download on iTunes, the attachment costs $150. As the smell of foods is known to trigger certain cravings, perhaps more brands will tap into mobile-powered scents as part of their marketing.